Panini does Hockey cards right. Playoff Contenders is one of their best. These are beautiful cards with a phenomenal checklist. The amount of quality autographs coming out of these boxes is seemingly endless. 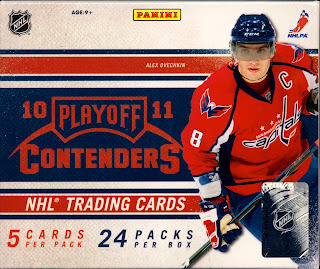 Here is our SPEED-break™ of 2010-11 Panini Playoff Contenders Hockey. Get ready for some amazing pulls. I have seen dozens of these boxes busted... and NOT ONE of them came anywhere close to the hits you pulled here. Sick. Just plain sick. I busted three of these and got no where near the caliber of pulls in just this one. I was so ashamed of mine that I didn't even post about them.